1. Focus on the Fed: Get ready for the third interest rate hike in seven months. The U.S. Federal Reserve is widely expected to push interest rates higher on Wednesday, continuing the central bank's move toward tighter monetary policy. The Fed raised rates in December 2015 for the first time in nearly a decade, then again a full year later in December 2016, followed by another in March. Investors will be looking at the details of what the Fed says about its massive balance sheet and the economy. Fed officials have indicated that they are likely to start winding down the central bank's $4 trillion balance sheet this year. The Fed bought trillions of dollars in debt during the financial crisis and the recession that followed to help the economy recover. But nothing is set in stone. The Fed could change course if the economy stumbles or if Congress delays raising the debt ceiling. 2. Whatever it takes: The International Energy Agency published its first look at 2018 on Wednesday, and the report contains some very bad news for OPEC. OPEC has been trying for months to eliminate a glut of excess supply that has kept prices from rising. The cartel has pledged to do "whatever it takes." But its efforts have been blunted by a massive boom in production by U.S. shale operators. The IEA said Wednesday that the trend is likely to continue into next year, with production by non-OPEC nations growing more quickly than global demand. "'Whatever it takes' might be the mantra, but the current form of 'whatever' is not having as quick an impact as expected," the IEA said. U.S. crude oil futures dropped 1.4% to trade at $45.84 after the report was released. 3. Uber problems: It's been a very rough 48 hours for the world's most valuable startup. Senior executive Emil Michael announced Monday that he was resigning. Uber CEO Travis Kalanick said he was taking an indefinite leave of absence on Tuesday. The departures come as multiple scandals roil the company. On Tuesday afternoon, the company held a staff meeting to share the findings of an investigation into sexual harassment allegations and workplace culture at Uber. The gathering did not go as planned. Uber board member David Bonderman made a joke during the meeting about gender stereotypes, saying that having more women on the board would just lead to more talking, according to leaked audio obtained by Yahoo Finance. Bonderman resigned from the board hours later, acknowledging that the comment was "careless, inappropriate and inexcusable." 4. 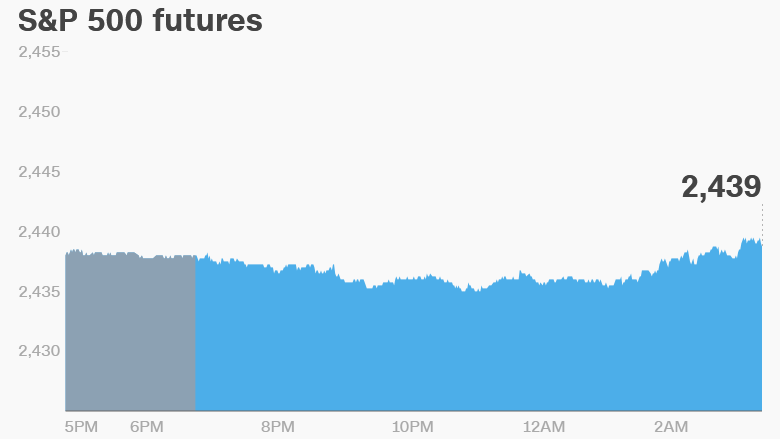 Global market overview: U.S. stock futures were higher on Wednesday. European markets advanced in early trading, with most gains limited to less than 1%. Asian markets ended mixed. The Dow Jones industrial average gained 0.4% on Tuesday, while the S&P 500 added 0.5% and the Nasdaq increased 0.7%. 5. Stock market movers: General Electric (GE) shares were higher in premarket trading. The stock popped earlier this week after Jeff Immelt, who has led GE since 2001, announced that he was stepping down. 6. Economics: U.S. data on retail sales and inflation will be released at 8:30 a.m. ET. A report on crude inventories will follow at 10:00 a.m.